"Land Commissioner George P. Bush’s primary opponents are making their last stand at the Alamo" was first published by The Texas Tribune, a nonprofit, nonpartisan media organization that informs Texans — and engages with them — about public policy, politics, government and statewide issues. SAN ANTONIO — During a recent rally in front of Texas’ most iconic structure, three Republican candidates for land commissioner said the state was in the middle of a second Battle of the Alamo. Speaking to dozens of supporters waving Texas and “Come and Take It” flags, the hopefuls were united in criticizing incumbent Land Commissioner George P. Bush’s Alamo oversight plan, saying it’s expensive, isn’t transparent and takes the focus off the 1836 battle at the mission. Representatives for Bush say the General Land Office’s Alamo plan is often misconstrued, but it has still become a central focus in his race for re-election. Bush has long been considered the favorite with his large war chest, famous last name and incumbency. But the restructuring of management of the beloved Alamo has created a key rallying point for his challengers — which includes his predecessor. Since Bush took office in 2015, the General Land Office has overhauled how it manages the Alamo. The Daughters of the Republic of Texas were removed from their oversight role and replaced by nonprofit boards. The GLO also commissioned the Alamo Master Plan, which the city of San Antonio approved in May. Among its proposals are restoring the mission, marking the historic footprint of the complex and repurposing the buildings opposite the Alamo to house a visitor center and museum. Part of the plan also addresses the future of the Cenotaph, a monument on the site commemorating the defenders of the Alamo who died. The first phases of brainstorming the master plan were marketed as a “reimagining” of the Alamo, said Bryan Preston, director of communications for the GLO. “The most vital part of this project is preserving the Alamo itself. I hope folks don’t lose sight of that fact,” Preston added. But Bush’s primary opponents say the $450 million plan actually lessens the site’s emphasis on remembering the 1836 battle. “The Reimagine the Alamo plan was going to take the focus totally off the battle, remove the Cenotaph with the defenders' names on it several blocks away, completely off the property, and make it into a politically correct theme park in essence,” Range said. Preston said that under the master plan, the Cenotaph will be repaired and have names of defenders added to it who have been discovered since it was built in 1940. He also said there is no final decision about where the Cenotaph will stand, but that it will always stand. Preston said the Cenotaph is currently located to the right of the front of the Alamo because that land was available. He said it could remain there or move to one of two locations — an area south of the battlefield but on the complex, or a location historically thought to be a funeral pyre for the defenders about a five-minute walk away from the complex on Commerce Street. In a recent interview with Texas Tribune CEO Evan Smith, Patterson said he is open to moving the Cenotaph outside the south gate of the Alamo as long as it is not out of sight. Because the Alamo’s a symbol for liberty, heroism and what it means to be a Texan, it’s easy to see how it could spark such heated debate, said Richard Flores, a University of Texas at Austin professor of anthropology and Mexican American studies. The Alamo was a topic during the state’s 2017 legislative session, when lawmakers allocated $75 million toward restoring the site. In December, the Texas Senate Finance Committee peppered Bush with questions about how this money was being spent, asking for increased transparency. The committee said Bush had set up a “convoluted” system of nonprofits contracting with the state to maintain the Alamo and plan for its future. An internal audit draft obtained by several news organizations found the “unusual” arrangement to manage the Alamo does not comply with all state laws and requirements and is not as transparent as it needs to be. Bush has said the draft had been “doctored” and is the subject of a law enforcement investigation. Bush has defended this system of nonprofits, saying they create more financial efficiency and also benefit fundraising efforts. Bush created the Alamo Complex Management, renamed the Alamo Trust — housed under the Alamo Endowment — to oversee the Alamo’s daily operations. Bush, who has served as chairman of the board overseeing this non-profit, has said he would step down from the post to avoid any perceived conflict of interest, but will remain on the board of the fundraising arm. “Every other historic monument in Texas that is honored and cherished by Texans is structured similarly with the non-profit structure,” Bush told reporters at a Texas Public Policy Foundation appearance in January. Rattling off the things he would do differently if elected, Patterson said using nonprofits to conduct state business isn’t transparent. “I would eliminate a couple of the nonprofits where state money is being spent...and you can’t get an answer through open records requests as to how it’s being spent,” Patterson said to the Tribune. Range was opposed to the nonprofits as well, saying it’s a huge problem to keep taxpayer money hidden in this way. Alamo Truth, a website Bush established that outlines his plan, fights back against this notion, stating that the tax records of nonprofits handling state money are available on GuideStar. This online service, which aggregates IRS data from nonprofits, requires a paid subscription. According to information accessible on GuideStar, the revenue brought into the Alamo Trust during the fiscal year beginning July 1, 2016, and ending June 30, 2017, is the same as their expenses. Brittany Eck, a spokeswoman for Bush, explained that state money is used to repay the nonprofit for employee salaries and other expenses. “All tax dollars being spent on the Alamo are available to the general public through the Texas General Land Office — and have been since Commissioner George P. Bush took office,” Alamo Truth reads. While the Alamo issues, along with the Hurricane Harvey recovery, have given Bush’s opponents some ammunition in the primary, they still face a steep hill when it comes to keeping pace with the incumbent’s war chest. Since last January, Bush has raised more than $1.5 million and has more than $3 million cash on hand. Patterson brought in $107,588 during the same time period, including $20,000 he loaned himself. He currently has more than $98,000 cash on hand. Edwards has raised less that $15,000, leaving him with less than $9,000 on hand. Range reports no cash on hand. Disclosure: The Texas General Land Office, the University of Texas at Austin and Jerry Patterson have been financial supporters of The Texas Tribune, a nonprofit, nonpartisan news organization that is funded in part by donations from members, foundations and corporate sponsors. Financial supporters play no role in the Tribune's journalism. Find a complete list of them here. Land Commissioner George P. Bush’s primary opponents are making their last stand at the Alamo By Claire Allbright March 1, 2018 SAN ANTONIO — During a recent rally in front of Texas’ most iconic structure, three Republican candidates for land commissioner said the state was in the middle of a second Battle of the Alamo. Speaking to dozens of supporters waving Texas and “Come and Take It” flags, the hopefuls were united in criticizing incumbent Land Commissioner George P. Bush’s Alamo oversight plan, saying it’s expensive, isn’t transparent and takes the focus off the 1836 battle at the mission. “We are politicizing it right now, and we shouldn’t have ever gotten to this point,” said Davey Edwards, who spoke to the crowd along with fellow candidates Jerry Patterson and Rick Range. “We shouldn’t be out here today, politicizing it, but we are. We have to. As Texans, we have to defend our Alamo.” Representatives for Bush say the General Land Office’s Alamo plan is often misconstrued, but it has still become a central focus in his race for re-election. Bush has long been considered the favorite with his large war chest, famous last name and incumbency. But the restructuring of management of the beloved Alamo has created a key rallying point for his challengers — which includes his predecessor. “Rick, Davey, we are all on the same page, we all have the same goal,” Patterson, the former land commissioner, said at the rally. “What I want you to do is pick one of us, but … sure as hell don’t pick George P. Bush.” Since Bush took office in 2015, the General Land Office has overhauled how it manages the Alamo. The Daughters of the Republic of Texas were removed from their oversight role and replaced by nonprofit boards. The GLO also commissioned the Alamo Master Plan, which the city of San Antonio approved in May. Among its proposals are restoring the mission, marking the historic footprint of the complex and repurposing the buildings opposite the Alamo to house a visitor center and museum. Part of the plan also addresses the future of the Cenotaph, a monument on the site commemorating the defenders of the Alamo who died. The first phases of brainstorming the master plan were marketed as a “reimagining” of the Alamo, said Bryan Preston, director of communications for the GLO. “'Reimagine' has been badly and I would say intentionally mischaracterized over the last year,” Preston said. “All that 'reimagine' was actually talking about is that someday you will actually be able to see all of [the battlefield] and connect with 1836 better than you currently can.” “The most vital part of this project is preserving the Alamo itself. I hope folks don’t lose sight of that fact,” Preston added. But Bush’s primary opponents say the $450 million plan actually lessens the site’s emphasis on remembering the 1836 battle. “The Reimagine the Alamo plan was going to take the focus totally off the battle, remove the Cenotaph with the defenders' names on it several blocks away, completely off the property, and make it into a politically correct theme park in essence,” Range said. 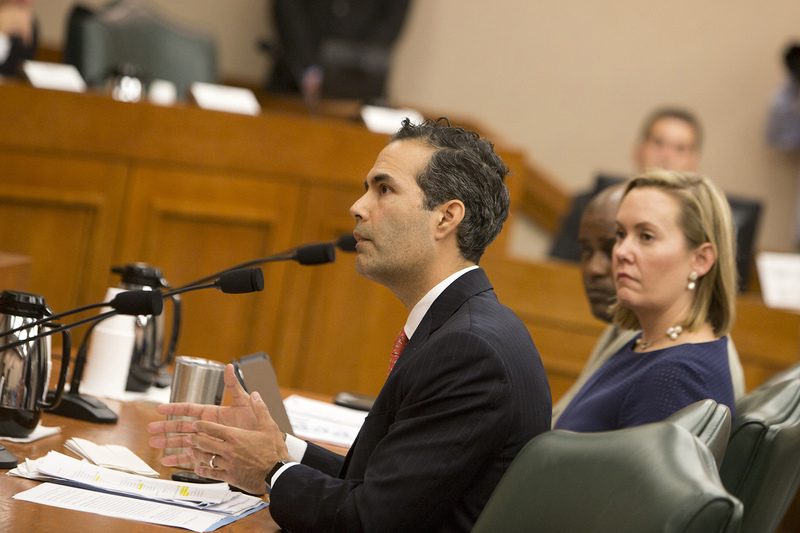 Texas Land Commissioner George P. Bush is shown testifying before the Senate Finance Committee on Dec. 5. A spokesman for the Texas General Land Office, which Bush oversees, says the office's Alamo management plan is often mischaracterized. Marjorie Kamys Cotera for The Texas Tribune Preston said that under the master plan, the Cenotaph will be repaired and have names of defenders added to it who have been discovered since it was built in 1940. He also said there is no final decision about where the Cenotaph will stand, but that it will always stand. Preston said the Cenotaph is currently located to the right of the front of the Alamo because that land was available. He said it could remain there or move to one of two locations — an area south of the battlefield but on the complex, or a location historically thought to be a funeral pyre for the defenders about a five-minute walk away from the complex on Commerce Street. In a recent interview with Texas Tribune CEO Evan Smith, Patterson said he is open to moving the Cenotaph outside the south gate of the Alamo as long as it is not out of sight. Because the Alamo’s a symbol for liberty, heroism and what it means to be a Texan, it’s easy to see how it could spark such heated debate, said Richard Flores, a University of Texas at Austin professor of anthropology and Mexican American studies. “There has always been tension about how to represent it because it was a mission first, it was in disrepair for so many years, it was in private ownership for a while and yet it’s the battle that has triggered people’s notion of identity and Texanness,” Flores said. “I think anybody who is trying to rethink how that place is represented is running against all these kinds of symbolic ideas and I think that is what George Bush is coming up against.” &nbsp; The Alamo was a topic during the state’s 2017 legislative session, when lawmakers allocated $75 million toward restoring the site. In December, the Texas Senate Finance Committee peppered Bush with questions about how this money was being spent, asking for increased transparency. The committee said Bush had set up a “convoluted” system of nonprofits contracting with the state to maintain the Alamo and plan for its future. An internal audit draft obtained by several news organizations found the “unusual” arrangement to manage the Alamo does not comply with all state laws and requirements and is not as transparent as it needs to be. Bush has said the draft had been “doctored” and is the subject of a law enforcement investigation. Bush has defended this system of nonprofits, saying they create more financial efficiency and also benefit fundraising efforts. Bush created the Alamo Complex Management, renamed the Alamo Trust — housed under the Alamo Endowment — to oversee the Alamo’s daily operations. Bush, who has served as chairman of the board overseeing this non-profit, has said he would step down from the post to avoid any perceived conflict of interest, but will remain on the board of the fundraising arm. “Every other historic monument in Texas that is honored and cherished by Texans is structured similarly with the non-profit structure,” Bush told reporters at a Texas Public Policy Foundation appearance in January. Rattling off the things he would do differently if elected, Patterson said using nonprofits to conduct state business isn’t transparent. “I would eliminate a couple of the nonprofits where state money is being spent...and you can’t get an answer through open records requests as to how it’s being spent,” Patterson said to the Tribune. Range was opposed to the nonprofits as well, saying it’s a huge problem to keep taxpayer money hidden in this way. Alamo Truth, a website Bush established that outlines his plan, fights back against this notion, stating that the tax records of nonprofits handling state money are available on GuideStar. This online service, which aggregates IRS data from nonprofits, requires a paid subscription. According to information accessible on GuideStar, the revenue brought into the Alamo Trust during the fiscal year beginning July 1, 2016, and ending June 30, 2017, is the same as their expenses. Brittany Eck, a spokeswoman for Bush, explained that state money is used to repay the nonprofit for employee salaries and other expenses. “All tax dollars being spent on the Alamo are available to the general public through the Texas General Land Office — and have been since Commissioner George P. Bush took office,” Alamo Truth reads. While the Alamo issues, along with the Hurricane Harvey recovery, have given Bush’s opponents some ammunition in the primary, they still face a steep hill when it comes to keeping pace with the incumbent’s war chest. Since last January, Bush has raised more than $1.5 million and has more than $3 million cash on hand. Patterson brought in $107,588 during the same time period, including $20,000 he loaned himself. He currently has more than $98,000 cash on hand. Edwards has raised less that $15,000, leaving him with less than $9,000 on hand. Range reports no cash on hand. Disclosure: The Texas General Land Office, the University of Texas at Austin and Jerry Patterson have been financial supporters of The Texas Tribune, a nonprofit, nonpartisan news organization that is funded in part by donations from members, foundations and corporate sponsors. Financial supporters play no role in the Tribune's journalism. Find a complete list of them here. Read related Tribune coverage George P. Bush’s secret mansion is financed by an undisclosed loan from Texas donor's bank Land commissioner says "doctored" audit critical of his agency's management of the Alamo is under investigation Texas lawmakers battle with Land Office over transparency in Alamo restoration "Land Commissioner George P. Bush’s primary opponents are making their last stand at the Alamo" was first published at by The Texas Tribune, a nonprofit, nonpartisan media organization that informs Texans — and engages with them — about public policy, politics, government and statewide issues. Link back to the original article, which is located at https://www.texastribune.org/2018/03/01/texas-george-p-bush-land-commissioners-alamo/.